Check out what one geeky crafter whipped up for her boyfriend’s birthday – a Mario Raccoon rug! That’s 386 granny squares of pure nerdy flavor. “Enemyairship” from Craftster, we salute your crafty skills. Back from a long hiatus I proudly present my experience at the most of prestigious conventions, the San Diego Comic-con ’09. I attended the convention from Thursday thru Saturday this year with my intention of seeing as many panels as possible and to walk the entire show floor, something I barely achieved last year. This entry is a brief overview of what makes the convention so attractive to the geek fan base that draws us in like flies to a bug zapper each year. Before I dive right in on what I did at the Comic-con you must first understand a little history, which you quickly pick up your first time there. Although the convention is built primarily on Comics it also has the tendency to absorb pop culture that we geeks find entertaining. In essence it’s a place where seeing people in costumes walking by are greeted with smiles and compliments rather then the quick dismissal of disapproving eyes. Usually on Saturday evening the people who do dress up compete in a costume contest consisting of both individual and group entries, this contest is also followed by a Masquerade Ball where people can break out attempts at moon walking in a storm trooper costume. In essence it’s a geeks paradise in the lovely town of San Diego for 4 days a year. One of the coolest parts of the convention is the panels. Panels are primary a group of directly connected individuals to a project such as actors and/or directors of a hit Scifi Tv series or a group of influential comic artists willing to lend a helping hand to future and upcoming comic book illustrators. With the convention picking gathering more and more population each year tv networks and game studio are attracted to the mass collective of geekdom which in turn provide attendees with Shwag or in simple terms free stuff!!! What does this mean for you? Companies trying to 1 up the next cause them to give out more and more desirable free stuff ranging from dvds to t-shirts and more. With comics and superheroes come action figures and Comic-con offers attendee special Comic-con exclusive items! Weeks before the convention you can find an enormous list of exclusive items sorted by vendors. Some of the more popular ones such as Hasbro and Mattel offer the “chance” to pick up items only available at the show. For example this year I was able to acquire most of the exclusive items I wanted included an 18” Stay-Puff Marshmallow man “Angry Face Edition” bank and a “Retractable claw Special Edition Wolverine Might Mugg”. If you miss out on picking them up, fear not next year you can always check out the mass amount of vendors and for a price pick up what you missed the year before. To the action figure collectors out there, welcome to heaven. Comic-con wouldn’t be anything without the artists that make our beloved comics and for fans of a specific artist you are almost guaranteed to meet up and strike up a conversation with them, please refrain from going fanboy it tends to freak some of them out. Some of the artists even accept commission work to be done during the days of the convention, which if you have some cash handy can get you some very cool personally made artwork. Because of the vast audience independently made comics and projects attending the convention allow for great exposure to fans and talent scouts. Although the booth may cost a little, nothing compares to the influence, exposure and feedback from the people who enjoy and respect your work. I came across a site today, The hylia after seeing a post about the FPS version of Zelda someone made. Here’s the video, it’s kind of funny to watch. But what perked my interest was that this zelda fan site was mentioned. It’s quite a cute site. I’ve been really into the series for a long time despite not really liking the Twilight Princess probably as much as I should have. But, anyways, the older games were fun to a younger me. So I’ve been peruzzing through their media sections of the various games. The things that interested me so much back in the day were the above view maps. In the old nintendo power magazines they’d add these to the magazines as cut-outs. I loved them. I’d be playing with the map all folded out on the floor, eyes darting back and forth between it and the television. It fascinated me so much all this land in the game I hadn’t seen but could play through (hence part of the wow addiction). Anyways here’s a map of the Super Nintendo Release “A link to the Past”. The 2nd Nintendo release, “The Adventure of Link”. And one of Ocarina of Time which was released on the 64. From the blizzard press release, blizzard has announced that sam rami(!!!!) will direct the new World of Warcraft movie. SICCCCCCK. LOS ANGELES, Calif. – July 22, 2009 — Blizzard Entertainment, Inc. and Legendary Pictures announced today that Sam Raimi has signed on to direct the eagerly-anticipated major motion picture based on Blizzard Entertainment®’s award-winning Warcraft® universe. Raimi has, in the course of his career, clearly demonstrated a genius for developing and adapting existing fictional universes for mainstream audiences while staying true to the spirit of the original content. Raimi directed the Spider-Man trilogy, which has broken box-office records around the world and garnered five Academy Award® nominations. Known for his imaginative filmmaking style, richly drawn characters and offbeat humor, Raimi wrote and directed the cult classic, The Evil Dead and produced 30 Days Of Night. He most recently wrote and directed the supernatural thriller, Drag Me To Hell. Charles Roven’s producing talents were recently seen with last summer’s blockbuster The Dark Knight, which grossed in excess of $1 billion, was nominated for eight Academy Awards® and won two. His body of work also includes the widely acclaimed Batman Begins and the sci-fi classic 12 Monkeys. Roven, with Atlas producing partner Alex Gartner, will be producing with Legendary Pictures CEO Thomas Tull, Legendary’s Chief Creative Officer Jon Jashni, Raimi and Raimi’s producing partner Joshua Donen. Raimi’s partner, Robert Tapert, will be an Executive Producer and Blizzard Entertainment’s Senior Vice President of Creative Development, Chris Metzen, a Co-Producer. 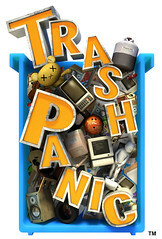 Here’s a little gem I found on the PlayStation Network last week, a puzzler by the name of Trash Panic. It was only 5 bux, so I said buss it, I’ll give it a chance. I’m glad I did, here’s some thoughts. The Good – Very fun puzzler that’s easy to pick up and play. At the start it almost feels like Tetris, so anybody can pick it up and ‘get it’, but it’s a much different game than that. Let me lay it out a bit, your view is from the inside of a trash can, from the side. Trash is slowly dropping from the top one piece at a time that you can direct as you please, you hit a button to rush it through or “smash” it. The goal is getting all the trash in a level to fit in the can without more than 3 unbroken pieces falling out. You can try to lay the trash out strategically(if you can), shake the controller which shakes the can which helps to compact the trash a bit at times. Sometimes you get lucky and a match or two comes through which burns and gets rid of some of the trash, that has it’s own strategy involved in that you can close the can lid to increase the time your trash burns. It’s very challenging and a lot of fun. Did I mention it’s only 5 bux? The Bad – When I say it’s challenging, I mean it…..this game gets freakin hard! How hard? I haven’t passed the 2nd level yet…..I know, noober style, time to check out some gamefaqs! MTV Multiplayer Blog has put up a mini interview with one of the main guys behind the latest DLC, Mothership Zeta. Here’s some deets! A New Beatles Rock band trailer has been release revealing more song’s on the upcoming game. Here’s the list of new tracks..
and for s’n’g here’s the list we already know. The heroes get together and discuss some good stuffs. Project Natal, Fallout 3 DLC delay, Starcraft 2 delays, Street Fighter 4 op npc Sagat and Seth, Bioshock 2, Call of Duty Modern Warfare, Harry Potter and the half blood prince, new releases and top 5 best/worst levels we have ever played! Listen to the 20th podcast! July 20, 2009 Posted by lurkerbelow | The Master Control Cast	| Fallout 3, Master Control Cast, Master Controler, mp3, Obama, podcast, Ringtone, yo mamma | Comments Off on 20th Podcast! Mmo-champion has data mined the tier 9 models for all classes and posted a entry about it. He posted every model with every possible race wearing it so there’s no chance in high hell I’m going to do that much work. The paladin’s look cool. But they look like the Elves from the Lord of the Rings RTS came. The dudes with the longswords. I may be imagining this though. Oh and I’ll note this, i’ll never ever see a piece of Tier-9. Ever. I’m a “scrub” as they call it in the wow-verse. While doing my morning browsing around the innerweb’s I clicked through the Apollo Moon landing 40th anniversary page. In buzz aldrin’s speech (seriously buzz, you need to go down with your name retired but that name is amazing) he “presented an elaborate slide show detailing how to make a quick visit to the moon a stepping stone to visits to the Martian moon Phobos, Mars itself, and even some asteroids like Apophis that may someday hit Earth”. Now being a lunar nut that I can be at times, I said wait a second. Apophis? So one quick trip over to wikipedia revealed a few answers. However, we do not get away so easily. In 2880. yes, 800 years in the future. Asteroid 1950 DA has a high likely hood of hitting earth. However in the next 800 years (a lot can happen in a few year imagine, 800), the trajectory can place it in one of two spots. One 13.2 million kilometers away or the other, a 1 in 300 chance, a dead on collision. Due to 1950 DA’s Size, approxmetly 1.1–1.4 km, “The energy released by a collision…would cause major effects on the climate and biosphere which would be devastating to human civilization.” Better prepare those bunkers now folks. Or book a ticket for Deep Space Nine. Me, i’ll be dust already so things are looking up. Wuz good my peoples…..as you can tell by my post title, I pulled a NOOBER….dunno if that’s a real word, but you get the idea. So I’m sittin here on a saturday with nothin to do, so let’s get in some Fallout 3! I got the perk that marks everything on the map, so I decide to hit up some spots that I haven’t seen yet. I’m still in the Point Lookout area, havin a good time, got about 4hrs in……go to leave a spot, and…….FREEZE….reload, FREEZE. Oh but my other saves work just fine, my autosave is jacked….problem is, my previous save is from 4 hrs before. Now I really should’ve known better, I think I was in a careless state since I was just doing side junk. Kids, don’t get careless, remember back in high school, they taught us to save our work every 15mins on computers, I say in big open world, exploring style games like this, save at least every 45mins. Now excuse me while I go jump off a building…..ok, that was a little excessive, I think I’ll drown my sorrows in some beer instead. My 'autosave' file is where his head used to be! July 18, 2009 Posted by richieraw | Normal Stuffs	| Fallout 3, Point Lookout | Comments Off on DON’T RELY ON AUTOSAVES! Tonight I decided to do an old movie. A movie also discussed on the 18th Podcast. A movie called Wickerman. So sit back and enjoy the review Dreammachines. Wickerman directed by Robin Hardy came out in 1973 starring Christopher Lee and a few other names. But I’m no name dropper plus I don’t think anyone would recognize the other people in this movie. The plot of this movie revolves around a police detective traveling to a small island to investigate a series of suspicious murders. I’m sure you can imagine what happens next on this small island. The plot line is notoriously thin but the atmosphere of the movie is fairly well developed for such a small budget film. This low budget film seems to embody the heart and soul of what similar low budget films of today have lost, the ability to rivet the audience no matter the cost of production. In my opinion low budget films today have lost the ability to pull the audience in to tell the story correctly. Wickerman has all the frights and spooks to keep you going through the movie but don’t expect it to scare your socks off. The story should be enough to keep you entertained and hopefully give you a real dose of authentic storytelling. As for nightmares I would expect you to have an uneasy night but nothing to bad, probably just the dream where your naked in high school again. Well, well pizza got here early. Looks like a cold beer and a hot slice await me. Also a nice scary movie with some friends and a couple of drunken laughs should be good times. Till next Friday, Don’t screw with Jason’s weed man just don’t do it. So I’ve been slacking a bit lately and lurker has been cracking the whip. Ok so he’s been nicely asking me to throw up a GBU for a recent game I’ve played. Best pseudo boss ever LOL. So I’ve been playing Resident Evil 5 lately as a break from Prototype. 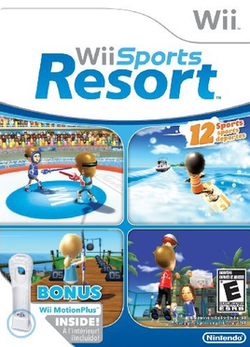 I’ve heard all the hype about this game being a first person race war shooter. White guys against black guys. Unfortunately the people who review these games at first glance don’t usually remember or care about the back story. The progenitor virus which was the Umbrella Corporations big breakthrough in regeneration of dead cells started as a discovery in the heart of Africa, where as it so happens most of the people living there are indeed of African decent. I just hate that people jump to the conclusion that it was a race related game when all they got to see was a demo that happened to have a bunch of black zombies being killed by a white guy and a black girl. So whatever let’s do a good bad ugly. GOOD: The game play is reminiscent of resident evil 4, game play and controls are basically what you are already used to. The AI for your smoking hot helper who has a very nice accent is very advanced. She can be set to cover you to be aggressive or to hold. And bonus if you destroy the B.S.A.A emblems through the whole game she has a separate outfit that she wears SMOKIN! Also the storyline to this one brings a lot of the series to a conclusion of sorts. The ending which I won’t ruin is very surprising. BAD: Ammo is scarce except on the easiest level forcing you to shoot a bad guy once and punch them for a finish, which to me isn’t as gratifying as shooting things. However its nothing that isn’t expected. All Resident Evil games have ammo spaced few and far between. I still wish I could spray and pray instead of sniping with a pistol. UGLY: The Lickers come back. I HATE LICKERS! No really I hate the freaking Lickers. Worst B.O.W.S ever made. Everyone wants power armor in Fallout 3. And by everyone I mean everyone with a brain. For those who don’t, well you’re just not RPing correctly. Ok. On top of it looking cool there are great bonus’s to energy weapon’s, damage resistance, rad resistance, str and charisma bonus’s. In game there are currently a few types of Power Armor. First though you’ll have to get the training to wear it. I got my power armor before Operation Anchorage came out which rewards you with the Winterized Power Armor. It comes with a whopping 10 million hp making it virtually impossible to have to repair it. By doing the Operation Anchorage route you’ll get the Power Armor Perk and wont have to do the normal chain to get it. Although the first way is part of the Main Quest chain. You’ll come across it anyways just your choice. I’ll take the easy route if it’s open. 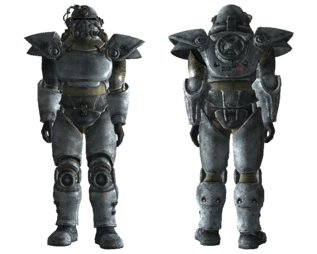 “In Fallout 3, you must receive training at the Citadel from Paladin Gunny or complete the Operation Anchorage DLC mission before you can equip power armor.” This is the armor. The only caveat is you have to run through the anchorage sim without any power armor. That’s probably not too big of an issue though. If you do it the normal means (why are you reading this go buy Operation Anchorage already! ), you’ll have to go through a series of quests on the main story line. It occurs after “waters” of life on this quest chain. Once you gain the ability to wear the power armor. One doing that quest you’ll trigger a cool event that I wont name and you’ll start to see Enclave Soliders and their juicy Power Armor. 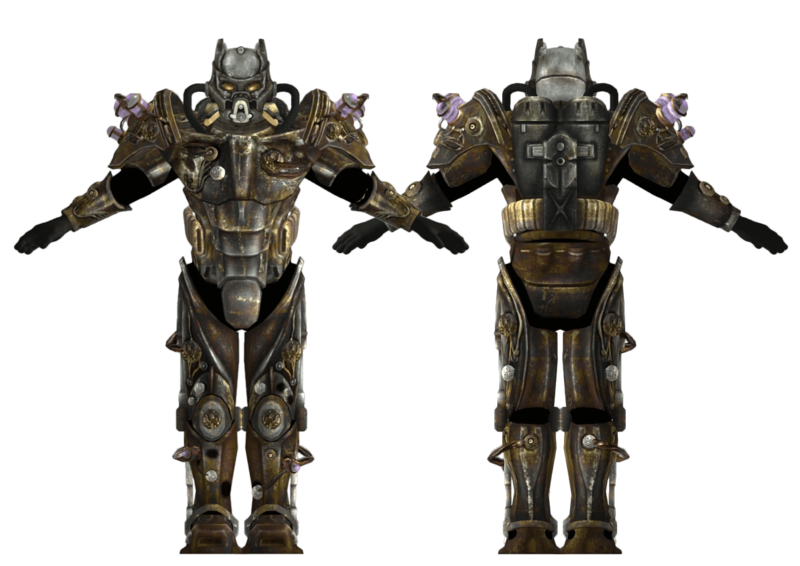 Most will just be the Normal Enclave Armor, but some will have the Tesla Power armor with the electrical shoulders. Check it out! Herooooo. Good morning. A very nice wakeup call appeared as I downloaded some podcasts, most notably the new Giant Bomb, which is always enjoyable. Blizzard released a question and answer session for Druid’s. Of course the restoration dominance was widly covered as well as why they made the distinction of Cats and Bear talents in the Feral Tree. It was really needed. When I was raiding on one of my druids, one of them being feral, I always felt out of place when I wasn’t tanking in bear form. Although I could do dps as cat it was never exactly meaning-full dps. Of course it was better than say a Protection Paladin or Warrior but oh well. You cant have your cake and eat it too right? There’s always the discussion of PVP viability for all classes and I have to admit that in Battlegrounds, every one is viable. Sometimes you win, sometimes you lose. That’s just a fact of life. In Arena, which has become increasingly ugly looking over time, I dont think many people care. I stand by my answer make cast bars different in arena. The players will adapt. On the pve end of this yo-yo article I have to laugh at how Greg, the lead dev, plays up this idea that Bear Tanks were never really viable tanks. It’s hard to have one specific tank to take you through the whole game. Certain fights required certain things. And all the tanks have specific abilities that make them good in certain situations. Out of the 3 bc tanks, only the Warrior was the least used in my experience. They were all enjoying the insane dominance in early PVP. (Our friend created a warrior for this reason and I quote “I’m tired of losing”). The restoration side of things is funny. I’ve always felt they’re perfectly fine. Resto fits my playstyle and the inception of Dual Spec made that possible for a short while. Blizzard like lost, leaves the best for last. It’s interesting to note that ONE artist did all those forms. Wild. Wild. Wild. We have multiple designers here and they have one. Mind Boggling. “Q: For the official word, do we have plans to update more druid form models at some point in the future? 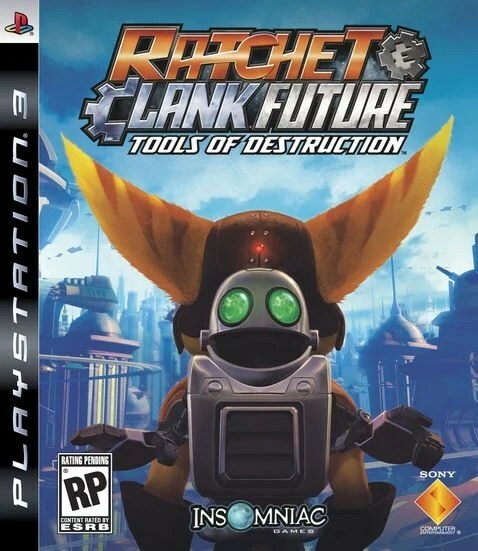 July 15, 2009 Posted by lurkerbelow | The Master Control Cast	| bruno, ghost busters, podcast, Ratchet and Clank, Video Game | Comments Off on 19th Podcast! Bethesda’s dropping some of the details on the next DLC for Fallout 3 Mothership Zeta which is set for release August 3rd!!! * Find and exploit new and destructive alien technology, like the Alien Atomizer and Drone Cannon. * Explore the vast Mothership and learn the secrets of the Aliens’ master plan. * Thwart the Aliens’ attempt to stop your escape, and take over the Alien ship before it wreaks havoc on the unsuspecting Earth below. * Fight against the Alien Invaders, their robot drones, and turn their own horrible experiments against them. * Ally yourself with an unexpected array of characters, both from the Capital Wasteland and from Earth ’s past. I cant help but think that they’re blowing through all the genre’s, aliens, zombies, simulations, apoloyptic stuff, where do they go next? Also can you imagine the size of the fallout 3 the complete edition of this game? It’s going to be MASSIVE. Sheesh. Totally on the Shivering Isle’s scale. And what’s up with the figures from Earths Past? You know they’re doing a alien jesus. They have to. Or Raptor jesus. Either works. Good: The weapons. In no other series will you find as entertaining of weapons as you do in Ratchet. Well..I’m kidding. I’m sure our wonder-kid would love to correct me about some game released in 1985 that did it before. Blowing up things has never been so much fun. Your weapons upgrade with more use, and also can be tricked out to do more damage. Though anyone whose played this franchise I’m sure will be aware of these already. The game is what’s called “old school” though, is 15 years ago really that old school? Are we just that old? It’s a game that’s more focused on fun than beating other people up and full-filling your childhood urge to beat up the playground bully that you never got to by beating someone in a online format. I’ll just put it that way. I like the bitter this morning. Put extra in it in my coffee this morning. The story line is fun, and even at times entertaining. It wont be winning awards like Star Wars Force Unleashed but it’s fun. Bad: The sixaxis controls are either good. or annoying. You’ll have to open a door so up will pop this little electrical board. Or that’s what I call it. You’ll have to juggle this little ball as the electrical current. It can get frustrating the 10th time you do it. Keep it at 5. Ugly: The cutscenes after you fly in on your jet. You see the same scene twice. With a woosh. Then as ratchet gets to the planet the music just stops. Silence. Then he lands. woosh again. Then he jumps out. It’s all so oddly cropped.